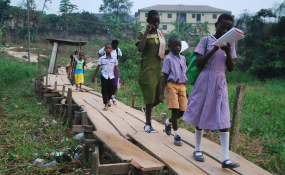 Pupils lament pains, long trek in search of knowledge. Her options are limited, it is either she abandons schooling for farming or commutes to school by riding on a motorcycle, but the daily cost is prohibitive for her parents, which is N300 at the least. This, her parents have repeatedly told her, they can't afford. Folahan is not alone in her predicament. There are many other students in Folahan's shoes, who live around the Erekiti corridor. During The Guardian's visit to the community, a young boy, Paul, a student of Ajara Junior Grammer School, Ajara Badagry, was accosted at Agbofipe at about 3:35p.m. on his way home. He had left school around 2:00p.m. and was still heading back home to Erekiti, when he was accosted midway at Agbofipe. This, the students take as routine occurrences, reason they usually move in groups while going and returning from school. When The Guardian visited the office of the Local Government Universal Basic Education Authority in Badagry to find out what can be done to alleviate the sufferings of many of the pupils who have resorted to trekking long hours just to access basic education, a woman at the office said that enquiries should be directed to the community chiefs whose job it is to lobby for the schools to be closer to their domain." "For instance, it is the duty of the respective chiefs in the villages to make land available for schools. And it is not just only to provide the land, but build the necessary structures and hand them over to the state government, who will now ensure through the State Universal Basic Education Board (SUBEB) that the building is ready for use and teachers can be posted for teaching." "Yes, I know about it but there is no solution to the problem for now. We are aware we have to make provision for the land and build the school on it, but the problem is not the land but the money to build on it. You know the situation of the country now. "Another factor delaying the project is that the five communities that make up Ajara are not united. If they are united, the school building can be at the middle of the town, but everybody wants the school to be in their community for their own selfish reasons. What then can I do as the father of all?" he said. "This is why as concerned parents, we are pleading with the local and state government to help us construct the bridge if they can site a new school closer to us, because of our children eager to learn. "It will make life easier for us and make us have hope of a better tomorrow. Please, Lagos State government, do something. We suffer a lot trying to cross the canal to school," he said.